2nd and 4th Friday of the month, at 10:30am in the Children’s Room. Join teacher Noami Edelman for yoga! Appropriate for babies, toddlers, homeschoolers, and their caregivers. Is storytime happening this week? Check our calendar! Ancestry’s genealogical databases are now available to patrons on our library computers. Search your family tree today, with records going back to the 16th century! 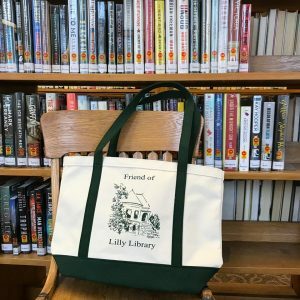 New Friends totes available at the circulation desk! Sturdy, wide, and deep, these will hold the heaviest of book hauls, while showing off your library loyalty! Your purchase supports newspaper and magazine subscriptions, museum and park passes, books, and more. 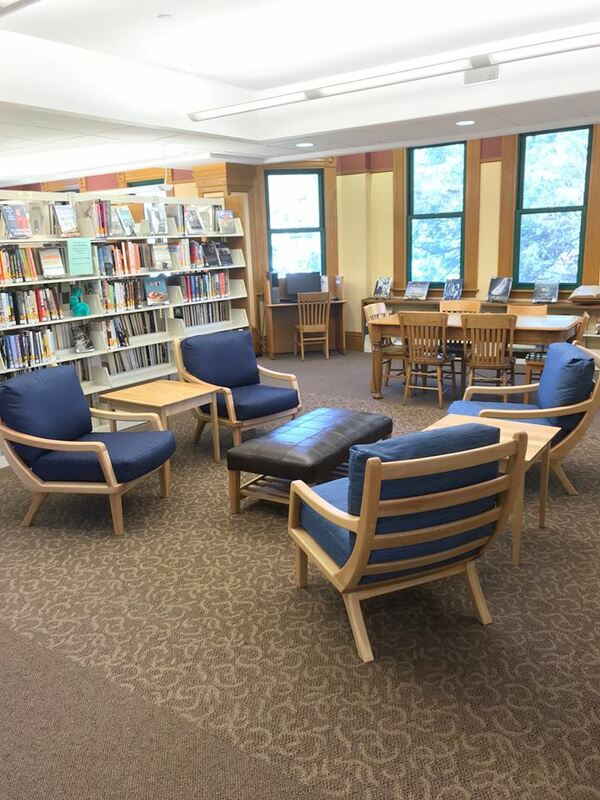 Thank you to the Friends of Lilly Library– our nonfiction room has gotten a makeover! Come see our cozy new spot. Pick up a book, pull up a chair, and admire all the greenery we’re surrounded by in beautiful Florence. Pick up a copy of The Glass Room by Ann Cleeves at the circulation desk. Michele has been trained and certified at Karuna Yoga. Decks available, though feel free to bring your own! Storytimes are on winter break, and will return the week of January 14. Materials Purchased Through Your Donation Will Receive a Bookplate “In Honor Of ….” or “In Memory Of ….” whomever you choose. There are many choices. You can choose! 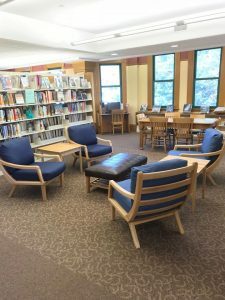 Thanks to your votes and the efforts of the Friends of Lilly Library, we have once again receive a Florence Bank Customers’ Choice Community Grant! Last year’s award was $2700. Since the start of the Florence Bank Customers’ Choice Community Grants program, we have won a grand total of $39,138. Thank you, supporters of Lilly Library for voting for us. Thank you, Friends of Lilly Library for your enthusiastic campaigning on our behalf. You help make our community strong! Voting for this year is already open, so get cast yours today! JOIN THE FRIENDS OF LILLY LIBRARY! Passes for Museums & Parks and More! Use your library card to start learning a language today–by watching movies!